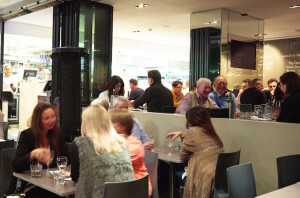 Planning on dining at Crows Nest? This is a dish you won’t want to miss this Autumn: roast queensland eastern king prawns w/ baba ghanoush, sumac + fine herb salad. The first step of this dish is to carefully trim the legs off the prawns and de-shell them. Then Hamish shows us a clever trick to de-vein prawns using a toothpick. In this dish, the heads are left on for presentation and it also helps hold the prawns together during the cooking process. Meanwhile a whole eggplant is charred directly on the flame of the cooktop to infuse a smoky flavour. Once it’s charred, the skin is removed to reveal an eggplant which is cooked in the centre and nice and soft. The baba ghanoush for this dish is rustic – no blending in this case, the eggplant is roughly chopped up. Then a tahini paste made from sesames is added, some fresh lemon juice, lemon zest, ground cumin spice, and some natural yoghurt. The natural yoghurt gives the dish a nice sour flavour to contrast the smoky elements. We also season with some salt then combine the ingredients together and set them aside for plating later. Next we get a nice hot pan sizzling and add the prawns that were prepared earlier. Once the prawns are almost finished cooking they are glazed with some garlic butter. This dish is quite simple and quick to plate up. We take our ready-made baba ghanoush and add it to the side, and then the king prawns are built up around the ghanoush. Snow pea tendrils are dressed with a small amount of oil and salt, and then layered on the prawns. To finish, we sprinkle some sumac, which is a sour berry ground down to a powder, lightly over the top. And there you have it! 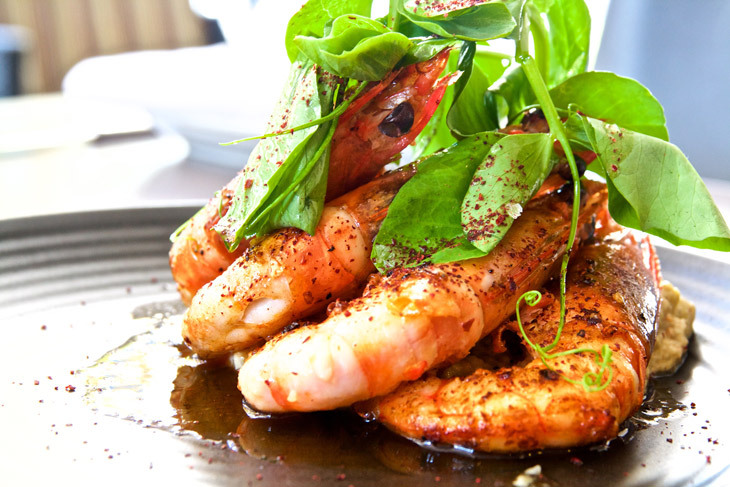 Roast queensland eastern king prawns w/ baba ghanoush, sumac + fine herb salad, an entree that’s not to be missed this season at Crows Nest. View the Crows Nest menu here or call 9966 0445 for bookings.